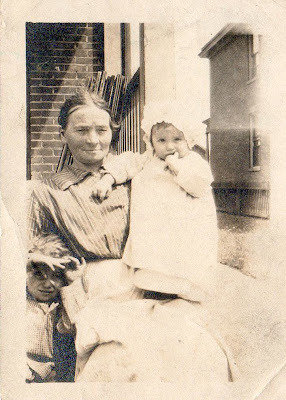 Wilhelmina Carolina Mueller, my great-great-grandmother, spent most of her life in a country far from the one she originally called home. She was born on Christmas Eve, December 24, 1859, in Germany. (1) Family tradition holds that she came from Bavaria. The picture below, showing her with two of her grandsons, was taken about 1911-1914 in the German Village neighborhood of Columbus, Ohio. John and “Mina” Herrel made their home in Cincinnati, where he worked as a carpenter, for the next 20 years. She became a U.S. citizen by virtue of her husband John’s naturalization, about 1890. Mina bore ten children, according to the 1910 U.S. census. (4) I have only been able to account for seven of them to date: Otto, Harry, Albert, Amelia/“Melie”, Edith, Bertha, and Frank Herrel. I believe two of the others were little girls who died young, but the identity of the tenth child is a mystery. Melie also died of diphtheria at a young age. I still have many unanswered questions about Mina. Who were her parents? What town in Germany was she born in? What were the names of her other children? And finally, what was she like? Was she a good cook? I wish I had thought to ask my grandpa, Fred Herrel, to tell me about his grandmother when I had the chance. From the photograph, she looks kind and motherly. In fact, she is smiling in most of the photos I’ve seen of her—a rarity in the days when solemn portraits prevailed. I consider Wilhelmina Mueller Herrel a “fearless female” because of the strength and hard work it must have taken to come to a new land, learn the customs and language, and raise a family. I hope that as time goes by I will find new clues to help answer some of the questions I have and come to know her a little better. Written for Lisa Alzo’s “Fearless Females” blogging series, as part of Women’s History Month. Lisa does a wonderful job writing about her ancestors and helping others do the same at her blog, The Accidental Genealogist. (1) “Ohio Deaths 1908-1953,” digital image, FamilySearch (www.familysearch.org: accessed 23 April 2009), certificate no. 55927 (1933), Wilhelmina Herrel; citing original records, Ohio Department of Health, Ohio Historical Society, Columbus. (2) 1920 U.S. census, Columbus Ward 3, Franklin County, Ohio, population schedule, E.D. 57, p. 1B, dwelling 18, family 18, John Herrell; digital image, Ancestry (www.ancestry.com: accessed 25 June 2009), citing NARA microfilm publication T625, roll 1380. (3) St. Peter’s German Evangelical Church (Cincinnati, Ohio), “Copulationen, Confirmanten, St. Peters Germeinde, Angefangen 1874,” p. 152, Johann Herrel and Mina Mueller marriage (1883); FHL microfilm #1514064, citing original records held by Wright State University, Dayton, Ohio. (4) 1910 U.S. census, Columbus Ward 1, Franklin County, Ohio, population schedule, E.D. 29, p. 3B, dwelling 73, family 74, John Herrel; digital images, Ancestry (www.ancestry.com: accessed 23 June 2009), citing NARA microfilm publication T624, roll 1180. (5) Wilhelmina Herrel obituary, Columbus Dispatch (Columbus, Ohio), 9 October 1933, p. 6A, col. 8. I like the way you reveal to us some ancestors who lived active, happy, and productive lives. Through hard work! Ten children, indeed! Your comment that Wilhemina is always smiling in photos is a good comment on her optimism. She was probably quite glad to come to America. Yet since she was a woman, her parents' names are unknown, and so is the town she came from. I hope you can find this information, maybe by some clue in her marriage records leading back to Germany or even Bavaria. Yes, Mariann, I keep hoping that a clue to Wilhelmina's origins is around the corner. I do share your feeling that she was probably glad to come to America, and I know she left a large and industrious family as a legacy here. Thanks for your comment!